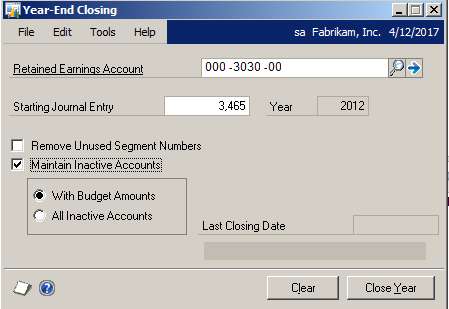 There are some really nice General Ledger enhancements that were released with the GP 2013 product! 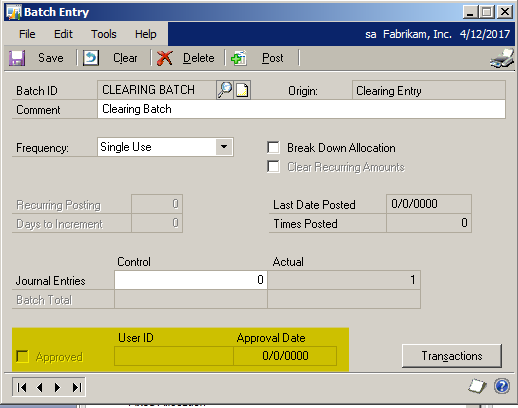 I am especially fond of the change to the GL year-end close process screen and the fact that the batch approval information will now be a stored field after the post! 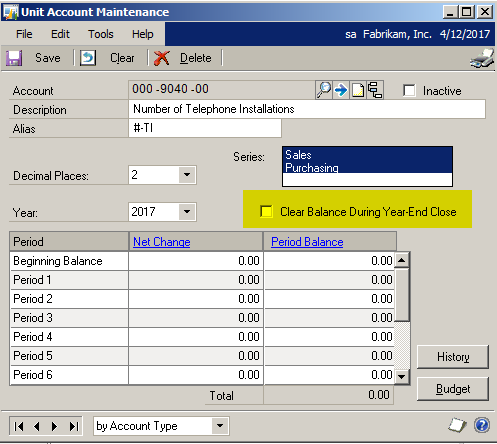 You can mark the Clear Balance During Year-End Close option in the Unit Account Maintenance window to clear the balance for the unit account during the year-end close process. If this option is unmarked, the balance for the account is carried forward to the next year during the year-end close process. This field marking did not appear to copy with the mass modify functionality with BETA product. Delete all inactive accounts with zero balances. Keep all inactive accounts with zero balances. 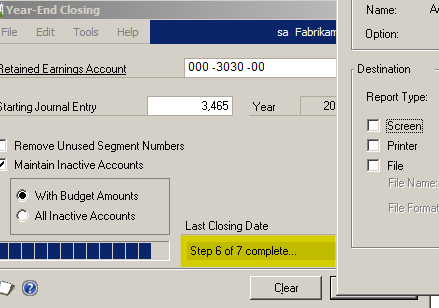 Delete inactive accounts with zero balances that have no budget amounts and keep inactive accounts with zero balances that have budget amounts. 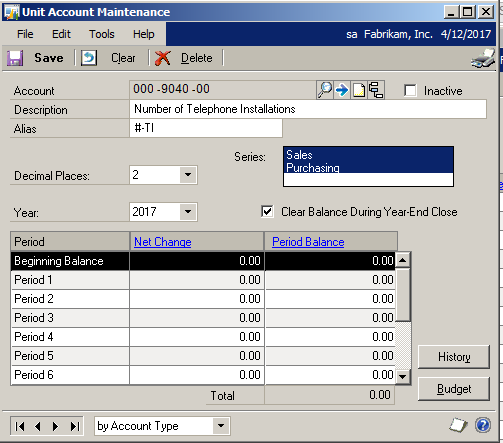 You can use the Unit Account Maintenance window to view period balances and net change balances for the selected account at the same time. You have the ability to track batch approval information for a General Ledger general journal batch in addition to the posting information that is kept. The approval user (APRVLUSERID) and date (APPRVLDT) are now stored in the Year-to-Date Transaction Open (GL20000) and Account Transaction History (GL30000) tables. You can use Smart List Builder, Excel Builder or a Reporting Services report to add those new columns to a report or inquiry. 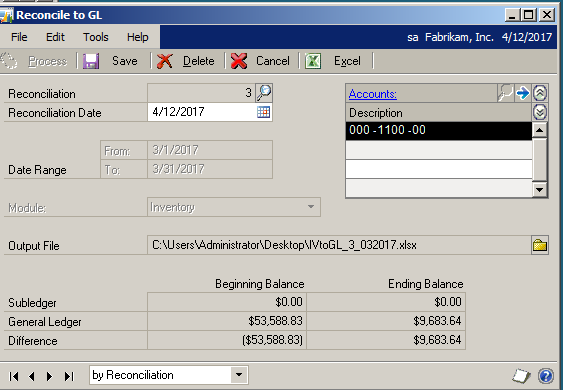 You can use the Reconcile to GL window to generate a Microsoft Excel spreadsheet that can help you match transactions in General Ledger with the originating transactions in Payables Management, Receivables Management, Inventory and Bank Reconciliation. The reconcile routine will not change data automatically, but helps you identify those transactions which may need to be corrected. The process is now tracking a reconciliation number and stores a path to the reconciliation worksheet. The reconciliation number is not ‘reused’. The setup and resulting summary reconciliation information is stored in the GL40401 and GL4002 tables. Learn more about Microsoft Dynamics GP 2013. Microsoft Partner, InterDyn BMI holds a Gold Competency in Enterprise Resource Planning.